with towel bars through the glass. click here to send us your shower sizes and shower style. The Signature By-Pass Semi Frameless Glass Slider. Stock and custom sizes available. Installation is easy . view semi frameless installation instructions. 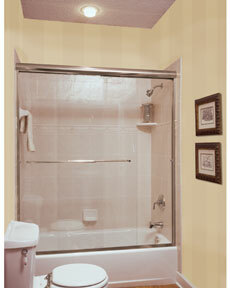 Upgrade the towel bars for your sliding glass doors online with many luxury styles available for sale. Sliding glass door panels in the picture above have the 24" glass bar towel bars which are called Overture 2 luxury series shower hardware. our Shower Shower Doors online quote form. 3/8" Clear Glass, 3/8" Decorative Rain Glass, 3/8" Bronze Glass, 3/8" Smoke / Grey Glass and also 3/8 Satenglas. 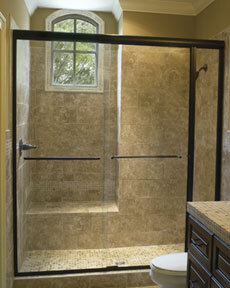 Click this link To view our Decorative Shower Door Glass Options. Silver/Chrome, Gold , Brushed Nickel , White , Brushed Bronze , Oil Rub Bronze. For a quote today or contact us online at Shower Diagrams and online shower quote form . Thanks for Visting our site. Great addition for Living Rooms, Hall ways, Foyers, and Bathroom Vanities. Shower Units for the "Do It Yourself" Homeowner!